Jerrine “Jerry” Patricia Reed, 92, of Gardner, KS passed away Nov. 18, 2016 at Olathe Medical Center. Funeral service 11:00 am Tues., Nov. 22, 2016 at First Presbyterian Church, 138 E. Shawnee, Gardner, KS. Burial follows at Gardner Cemetery. Visitation 10:00 am before the service at the church. Memorial contributions may be made to First Presbyterian Church, Gardner, KS. Jerry was born July 6, 1924 in Snoqualmie, WA to William Wallace and Alta Azile (Overly) Renton. She grew up in Washington state where she graduated from Issaquah High School. Jerry earned her BS in Home Economics from the Univ. of Washington in Seattle. She married Daniel “Dan” Reed on July 19, 1946 in Manhattan, KS. They lived in Manhattan and moved to Gardner Lake in 1949. Jerry was a homemaker and active member of First Presbyterian Church of Gardner where she was a Deacon, taught Sunday School and worked in the nursery. 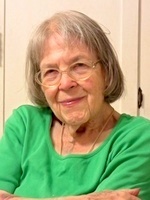 She was a life member of the Gardner Eastern Star and Athena Club. Jerry loved to quilt and was a good seamstress. She will be dearly missed by family and friends. She was preceded in death by her parents; husband, Dan, in 2013 and son-in-law David Miller in 2015. Jerry is survived by children: Mary Ann Miller, Manhattan, KS, Barbara J. Brown, Stillwater, OK, Thomas B. and Ying Ying Reed, Shanghai, China, Daniel W. Reed, Gardner, KS and William G. and Judith Reed, McKinney, TX; 11 grandchildren; 6 great-grandchildren and brother, William Renton, East Wenatchee, WA.